Want to teach kids about following Jesus? Then download these original Gospel coloring pages. Our aim was to translate the “Jesus is King” themes from the Bible into a simple visual tool for teaching kids about following Jesus. Choose one download format below or scroll down to choose each page individually. Download as PDF and color the sheets however you like. 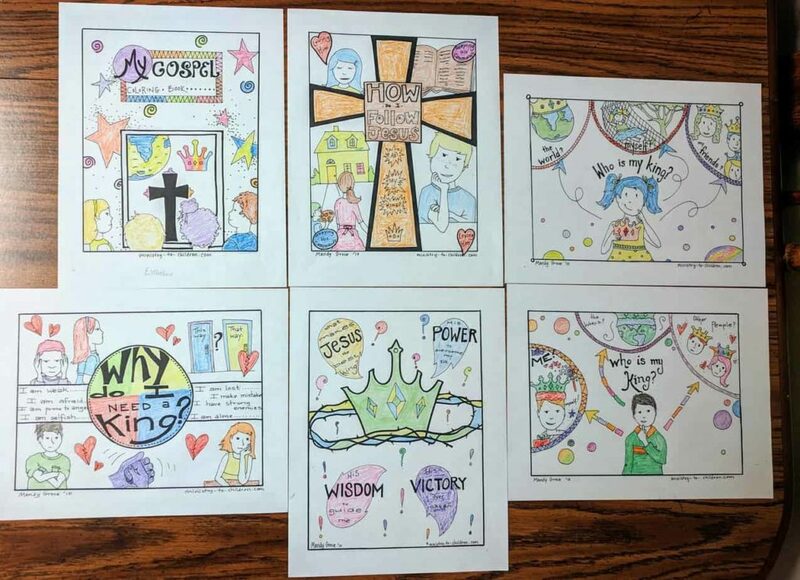 Here is our finished example of the Gospel Coloring pages. The inspiration for this work came from two places. First, we love the “Who Will Be King” booklet for kids. Second, we took direction from the older protestant catechisms about the Kingly Office of Christ. Print off the cover sheet for the coloring book. This post also introduces this series and explains what was the idea behind it. Use this page first if you are going to teach through the entire series of illustrations about King Jesus. Download links available for PDF or JPEG. Page One: Who is my King? The series begins by asking the children to look into their own hearts & minds. Where do they get their values? Who are they serving and trying to please with their lives? 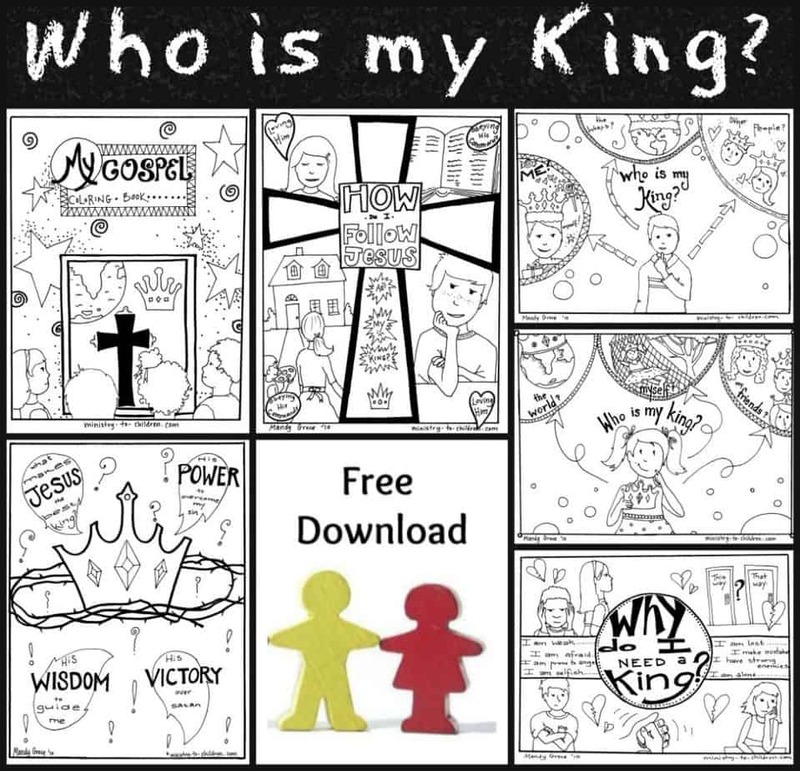 This coloring pages shows some different ‘kings’ that people often follow besides Jesus. There are two versions, one featuring a girl and the other featuring a boy. Page Two: Why do I need a King? Sometimes we don’t do a good job teaching children why we need Jesus. This coloring sheet highlights our need for someone to give us protection and direction in life. This is important because only King Jesus can solve the problems raised in this illustration. Page Three: What makes Jesus the best King? This one highlights the power of Jesus to overcome sin, his wisdom to guide us, and his victory over Satan. Each of those themes are God’s provisions for our need after the Fall. The crown represent Christ and the thorns remind us of his suffering on the cross. Page Four: How do I follow Jesus as my King? This final illustration helps children to respond to this truth about King Jesus. They will learn to respond by loving Jesus and obeying his commands. Like all our pages this one is free to use in your church, home, or school. This sheet pictures both boys and girls. Thank you so much for the talent you have in creating these colouring pages. They are being used for a pre-school Sunday school lesson that is talking about the Easter story. This is an awesome sit, I can literally stay on it for hours! Thank God for the publishers, and the talent. I Love it! This is a blessing! Our new plant church is hosting VBS free in a low income neighborhood. With almost no budget and many needs, your resources are truly a blessing. Thank you so much for making these for our kids. I absolutely LOVE your lessons and coloring pages you provide for us. Thank you for this resource. it will definitely impact on my sunday school teaching ministry. Thank you for these lessons and coloring pages. I will use them when I volunteer at a homeless shelter working with the kids on Thursday evening, while their parent as having worship services. Thank you, thank you. Mandy….what a blessing you are! Wonderful material, simply drawn, easy to understand and use. A real great find in a sea of Bible material for kids. I’m using your material in Sunday Schools, Kids Clubs and soon in an AFter School Club. Thank you SO much. Thank you so much, this will help me teach my children Bible stories with ease. I am not a good story teller and this will help me a lot. I teach Prek3- to 6th Grade, and I really appreciate the help of your creativity. Thanks so much for the lessons and coloring sheets for the little ones. I saves me so much planning time. May God continue to bless you for sharing your hard work and ideas. Tony Kummer (Editor) reviewed & updated this page on : March 12, 2019 at 10:22 am. All our content is peer reviewed by our readers, simply leave a comment on any post suggest an update.